I always try my best to look cute when I’m running errands. In fact, I would argue that there are so many missed #OOTD opportunities that I forget to capture when I’m on the go. That’s why I started taking these random elevator selfies and posting them on Instagram stories (because the quality is NOT feed worthy). 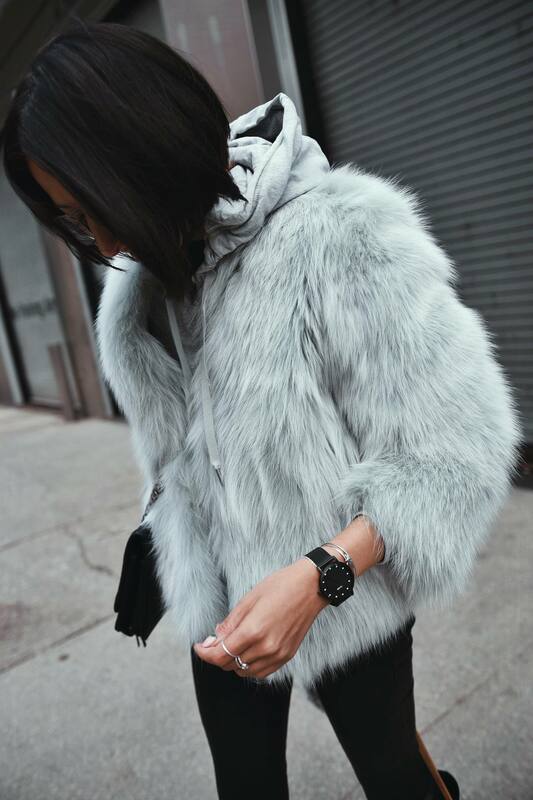 One staple that makes a cute, and functional, running errands outfit is a watch. And ever since I started working with CLUSE watches, they have become my go-to for both style and practicality. Really, I am the queen of multitasking when it comes to getting stuff done. If I can walk my dog, go to the bank and shoot a cute outfit, I make it happen. Doesn’t matter what you’ve got on, as long as you’ve got a show-stopping coat, a great pair of boots and fabulous accessories. And nails. Can’t ever go wrong with a mani. You see, I’m wearing a basic grey zip-up hoodie with a pair of black leather jeans. Simple and a bit luxe. But the whole outfit gets pulled together with my signature furry coat and crazy lady knee boots. Joking, they are Saint Laurent. I don’t wear them too often but when I do, I feel fabulous. 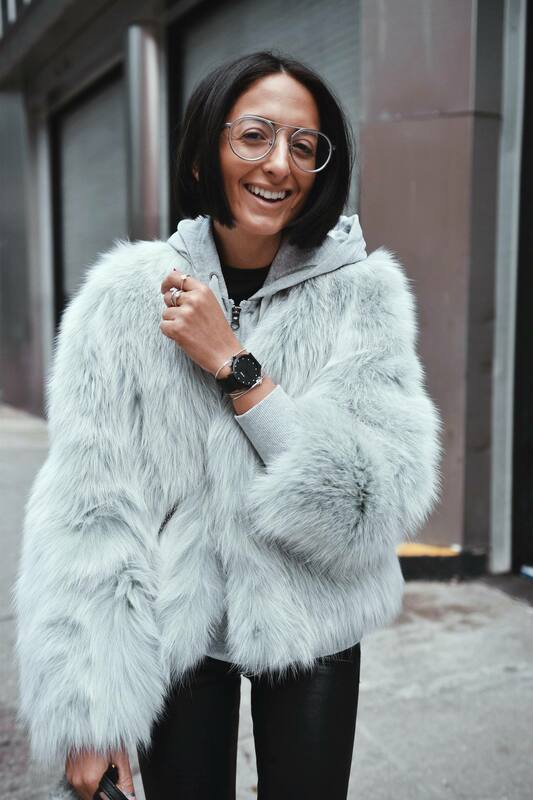 Sparkles have a way of brightening up my day – naturally, I chose to play off the sparkle theme in a subtle way with my CLUSE watch. In black mesh, with a black face, the timepiece really stands out with the addition of 12 crystals on the dial. Thank you very much! 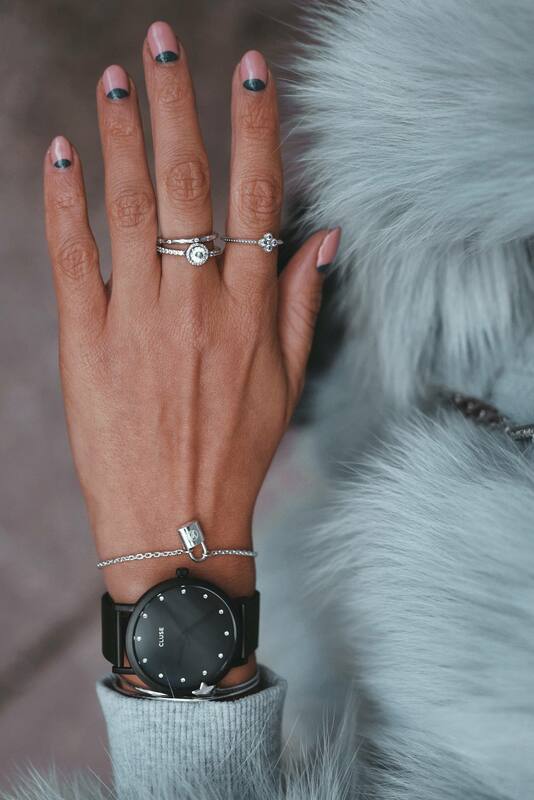 Nails: Whether they are painted, long, short, or clean – make sure you pick your jewelry to go with your nails. Watch: A watch sort of grounds the entire look. It’s probably the biggest piece and becomes the focal point; build up from the colours, textures and style of the watch. Bracelets: You might want to frame your watch with a few bracelets. Silver and gold bangles are always easy to stack and layer – they go with everything. Beads are nice too, and lanyards. Just be careful – piling on too many disparate pieces can be detrimental to your overall look. Rings: If you’re doing thing rings, you can have tons. If you’re doing bigger, cocktail-like rings, stick to one. I would also stick to one type of metal. Don’t mix silver and gold, unless you’re a pro. Tanned Hands: Let’s face it. Pale, dry hands look like crap. I’m always so jealous of darker skin tones because their hands always look so beautiful with any type of jewelry and nail polish colour. What do I do? I fake it. 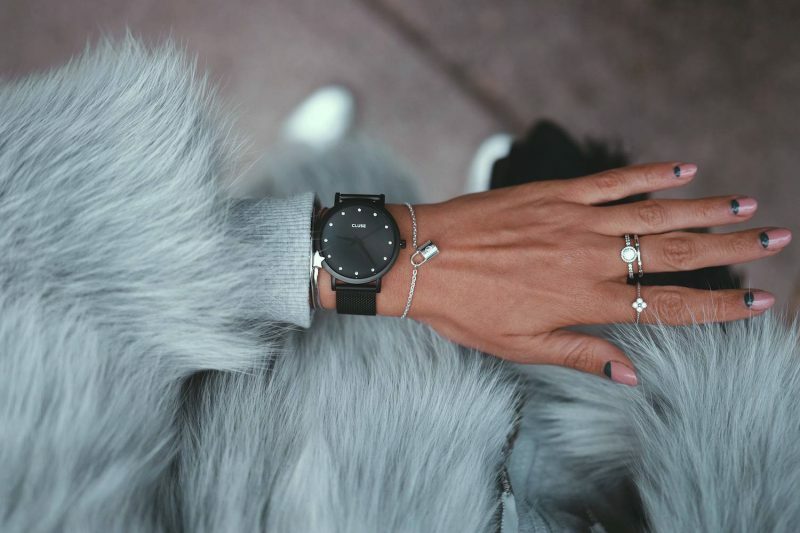 I always layer on some self-tanner on my hands to make the jewelry pop! This post was sponsored by CLUSE watches, however the opinions are my own. I love this!! So so so fabulous. Your boots are stunning.